Ulster secured their place in next season’s European Champions Cup and crucially a home Guinness PRO14 play-off with a dominant performance at Murrayfield last night. 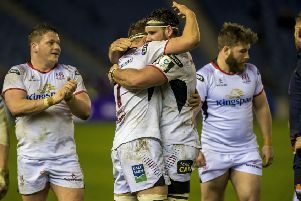 A bonus point 29-7 win ensured Ulster moved clear in second place in Conference B and leave them with a home quarter-final on the weekend of May 3 and 4. With Benetton losing at home to Munster last night - in spite of the Italians looking as though they might cause an upset at one stage - Ulster are now seven points clear in second place as the regular league season reached its penultimate weekend. 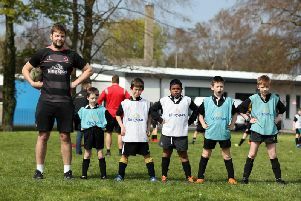 Everything Ulster failed to bring to Scotland last weekend in a 30-7 loss to Glasgow, they found during a big week in training to totally dominate Edinburgh, who started the evening three points behind the Irish Province as the race for the play-offs reached boiling point. But from the off Ulster showed physicality and endeavour as they cut Edinburgh off at source and importantly they showed a real clinical edge. Ulster dominated the first half and thoroughly deserved their 15-0 interval lead. Early pressure forced Edinburgh on the back foot and into conceding a penalty which Ulster scrumhalf John Cooney duly goaled for a 3-0 lead after four minutes. The home side's defence soaked up a lot after that setback and put enough pressure on Ulster for Luke Marshall to kick out on the full. There was a blow for Ulster on the ninth minute when they lost tighthead prop Marty Moore to a lower left leg injury, Ross Kane getting summonsed sooner than expected. Ulster continued to be the dominant force and Jacob Stockdale, starting at fullback, made a little break before kicking ahead, Edinburgh scrumhalf Henry Pyrgos getting to the ball, but put under serious pressure from winger Robert Baloucoune. Ball was turned over and Marshall was just held up short. Stuart McCloskey could not batter his way over and then Nick Timoney was stopped short. Edinburgh lock Grant Gilchrist made a rip tackle, the ball went loose and it was Ulster backrow Jordi Murphy who reacted quickest going over for the try - confirmed after Nigel Owens had consulted with the TMO. Cooney's conversion made it 10-0 after 12 minutes. A break from Gilchrist put Edinburgh in a good position and when Marshall went off his feet at a ruck, outhalf Jaco van der Walt opted for the points, but his effort rebounded off the right pole - and Ulster eventually secured the dangerous bouncing ball and exited. As the half went into the final 10 minutes, Ulster upped the tempo and Marcell Coetzee and Murphy made inroads towards the try line. Coetzee and Timoney led the next wave, before Billy Burns fed Kieran Treadwell as the sixth phase. But prop WP Nel turned over at the ruck, Ulster were penalised and Edinburgh had an easy exit. But the home side could not make any inroads and a break from Cooney on the left threatened to open them up, but Pyrgos made a great tackle before the offload could be made to Baloucoune. A massive brust from winger Duhan van der Merwe suddenly put life into Edinburgh and there was a bigger cheer when prop Nel burst through the middle before Darcy Graham linked with Mark Bennett - the winger tackled and knocking on. At the scrum Ulster won the penalty, but having put into touch the lineout was lost, but Edinurgh replacement outhalf, Simon Hickey let the visitors off the hook by kicking out on the full. Ulster saw their opportunity and launched one final assault as the clock went into the red. Stuart McCloskey punched a hole in the Edinburgh defence and then Billy Burns gave a lovely pass to the accelerating Baloucoune and he skinned Graham on the outside and fended off the intended tackle from Hickey to score in the corner. Cooney could not convert the touchline effort, but Ulster had one foot in the play-offs leading 15-0 at the break. Edinburgh had a lot of possession in the third quarter, but Ulster defended well and were never really put under any threat as they controlled things and forced the home side into making mistakes. they also made three early replacements, among them John Barclay for Magnus Bradbury in the backrow. From one Edinburgh mistake, a kick out on the full, saw Ulster go from the lineout, Marshall's perfectly timed pass drew the defence for Stockdale to race onto the ball and he popped it out to Robert Lyttle, the diminutive winger taking three Edinburgh players over the line as he scored. Cooney converted and Ulster had a 22-0 lead after 54 minutes. Edinburgh at last found the form that has seen them into a European Champions Cup quarter-final and challenging for the PRO14 play-offs. It was Barclay who finished off the move with Hickey converting to cut the arrears to 22-7 after 57 minutes. That put a bit more belief into the Edinburgh side, , but having popped a penalty into touch Ulster turned the lineout over and it was an opportunity missed potentially for the hosts to get back into the game as it crossed into the final quarter. Ulster used that opportunity to press forward and Cooney linked with Lyttle only for the move to be pulled back for a forward pass. Burns then angled a supeb kick to the left corner and Lyttle was up like a whippet, but the Edinburgh cover ensured the bonus point try was not coming on this occasion. Marshalll was putting himself about in defence and then attack, trying to get Stockdale away, but Edinburgh were able to cover. Burns then tried to find a way through as the visitors pressed for that bonus point securing fourth try and after the pack had gone through several phases and got close to the line, it was Burns who finished off the move to secure the try which secured a home quarter-final in the play-offs. Cooney put the icing on the cake with the conversion to complete the scoring.